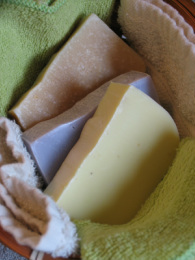 Homemade Lye Soap. Just like the old stuff Grandma used to make. Homemade bar soaps . . .
...are great ways of staying clean and healthy with GREEN Earth-friendly products. 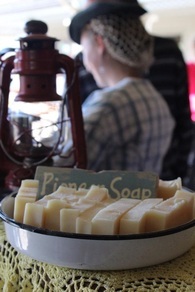 All of our soaps are moisturizing and great for sensitive skin. Some are good for all-over-body use, others designed specifically for face, some are good for your hair, and yet some still just for those work-worn hands of yours. The oils and butters are completely all- natural . . .
...and some are even organic. Each bar has one common ingredient- lye. Or as the scientists call it- Sodium Hydroxide. Realizing of course the harmful qualities it possesses in its raw, untamed state, we use the utmost care to not over-measure it (over-saturate the soap). 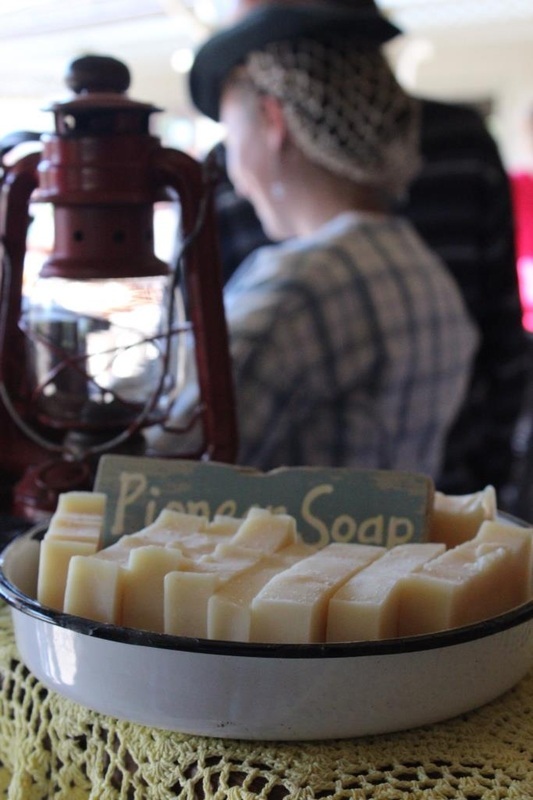 As well, we allow at least a one week time period for the curing process, which allows the lye to neutralize and the water content in the soap to evaporate. Among the different natural fats, oils and butters we use are tallow, coconut oil, sunflower oil, olive oil, and cocoa butter. 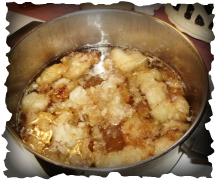 One of the special ingredients we have the pleasure of using is All-Natural Beef Tallow. 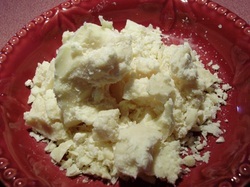 Tallow is an ancient additive in homemade soap, and makes the bars very hard and long-lasting. (For additional historical information, see our "Ol' Facts" page.) Our neighbor is a farmer and butcher, and he blesses us with as much tallow as we need. At his Crooked Creek Farm, he and his family raise cattle and pigs, and then butchers them with the finest of meat cuts, leaving plenty of tallow and lard behind. That's the part we get to use. 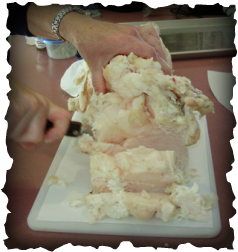 We then chop the tallow into 2-pound chunks and freeze it (since we get it in 50-100 pound quantities). By harvesting the fats from our local butcher, we know the quality is to be trusted, and have great happiness in adding it to our soaps. 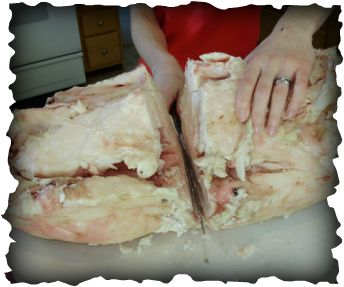 A great big raw hunk of tallow~ straight from our butcher neighbor! Melting tallow to blend and strain for a pure product. Want to make some yourself?